This article will show you how to save money on your land-line phone. Many people still like the security of a land-line phone and if you have a business it is almost a necessity. If you have reliable internet service, you can easily cut the price of your land-line in half if not better. We went from a $60-$70 bill (USA) to less than $10 per month for a much better service! Anyone can do it if you have a little technical knowledge. How do we save so much money? We made the shift from our standard Verizon service with two phone numbers, to Voice Over Internet Protocol (also known as VoIP). When we were with Verizon, we had the very basic service for each of our numbers. With VoIP we have built-in caller ID, voice mail which we have sent to our email as an attachment, and more importantly, the ability to block phone calls from specific numbers. If we have specific telemarketers calling us from the same number all the time, we simply block their number. It’s GREAT! All for less than $10 per month for two phone numbers! We even switched our existing phone numbers from Verizon to our new VoIP service! To make this possible, you need to have a solid high-speed internet service. DSL, Cable, or FiOS are the best, but you are not limited to these. The important thing to check is the amount of latency you have with your internet service. To find out what your latency is, go to speedtest.net. On the speed test, latency will show up as either ping, or latency, and will be in a box showing the number of milliseconds of latency you have. (ping and latency are basically the same thing for our purposes). If the latency is less than 150ms then you are in a great position to switch to VoIP. If it is between 150ms and 300ms, you will hear some noticeable lag or echo in your calls. If it is greater than 300ms, I would not recommend VoIP as an option. You can purchase a VoIP phone, but that is not necessary, and they are very expensive compared to standard phones. What you will need is a box called a VoIP phone adapter that will convert your internet signal to a voice signal and feed it into the existing phone lines in your house. 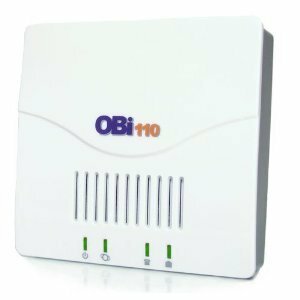 The one I have been using is the OBi110 Voice Service Bridge and VoIP Telephone Adapter found on Amazon.com for around $50. You will need one for each phone number you have coming into the house. The OBi110 gives you more flexibility than other devices because it allows you to tie into Google Voice which gives you free outgoing calls. Next you need to set up a VoIP account with one of the many providers out there. The one I chose and love is voip.ms. They offer LOTS of flexibility at very low prices. You also need to set up a Google Voice Account. Here’s the way it works. Your incoming calls will be routed to your VoIP provider, who will send the call to the OBi110 device which connects your internet to your phone line. Your phones will ring and work just like they normally do. Your outgoing calls will be sent from your OBi110 device to your Google voice account, and from there the call will be sent to the number you dialed just as normal. The only difference is that the person picking up the call will see your Google Voice number on their caller ID display rather than your normal number. That’s it! Your outgoing calls will be free with Google Voice, and your incoming calls will be charged at the rate of your VoIP provider. In my case it is $6.95 per month + $1.50 per month for 911 service. The additional phone number I have set up for $.99 per month on the basic plan because I don’t use it much. You will need to tweak things to work best for your own calling usage. The OBi110 can also be tied into individual phones if you like, instead of tying it into the entire house. The flexibility of this device is truly amazing. Initially I bought the OBi110, and tied it directly into my business phone just to check it out. I also had my regular Verizon service tied in at the same time so I could compare. After a month of testing, I could see the savings add up, and by the next month I had purchased another device and plugged them both into all our house phones. I then transferred or “ported” our existing phone numbers from Verizon to my new voip.ms service, and cut Verizon out of the loop completely. My bill for last month (May 2012) was $9.48 for both phones. This is my sixth month after the switch, and we are completely thrilled with the service and the savings. I am sure you would have the same results if you have a decent high-speed internet connection. If you have made the switch already or want to give it a try, please leave me some comments below. I love helping people save money! I do receive compensation from Amazon for the OBi110 links on this page, but would recommend the product whether I received anything or not. It is an excellent product. Free Calling with Google Voice…..
….. but wait! There’s More! In this article, you will find out how to make free phone calls with your land line to anywhere in the United States, using Google Voice. The thrifty & frugal minded, can also use this to completely discard their local phone bill while still maintaining their land line in their house. Google Voice, launched in March of 2009, is an internet based telecommunications system that allows for free calling to US residents within the US and Canada. It is designed to work in conjunction with your internet based smart phone, or computer to make calls through the internet, not the phone company. If you already have a calling plan with your smart phone that has unlimited calling, this may not interest you……… or does it? Many people have ditched their land lines because it doesn’t make sense to pay two phone bills. But now, if you have a broadband internet service, you can tie that back into your existing phone line in the house to make free calls. Google also assigns you a new number that will dial this new “land line” phone in your house. The new Google number can be configured to call your home phone and cell phone at the same time. It can be set up to translate voice messages to email or text messages. This is a truly remarkable tool in itself. First let me be clear. Google’s service only works through the internet, however it can make calls to any land line in the world (for a fee outside the US). With the purchase of a small little box that plugs into a standard telephone, it can also tie into your land line so that you can make outgoing calls just like you normally would with your land line, all for free within the US. What does this mean? Well, it means that you can now have your land line back without the cost! If you still have a land line, you can tie this device in to Google Voice and your normal phone service so that your outgoing long distance calls will be free! The device to do this is called the OBi110, and you can purchase it through Amazon for 49.99. You can often find coupon codes to lower the price to $43.99. I will try to keep this post updated with any available coupon codes. The down side? Well, the only downsides are the price of the OBi110, and Google Voice does not provide 911 service, but you can get this service through other providers such as voip.ms for $1.50 per month. You can also tie this service into the OBi110. This device is truly amazing. I have one now, and plan on purchasing another one to have an additional line out of the house. Our land line bill will be going away completely in the next month, once we get our business and fax line switched over. That’s over $50 per month that we will not be sending out the door. The first step (which is entirely free) is to set up a Google Voice account, to see how it all works. Once you have done that, and you are happy with the voice quality and reliability of the service, take the next step and buy the OBi110 device. You will not regret it. One last comment. Google Voice’s free phone calls are subject to change, but currently they are offering the free service through 2012 (just extended). I suspect they will be extending this again into the far distant future.